Turn your fall harvest into the perfect salad. Packed with charred veggies and garlic bread, slices of smoked salmon, fresh tomatoes and basil are what put this salad on everyone's "make-again" list! Preheat grill to medium-high heat. Clean and oil grill. Brush pepper, eggplant, onion, and zucchini with olive oil and season with salt and pepper to taste. Grill vegetables over direct heat until tender, 4 to 6 minutes, turning once halfway through grilling time. Brush bread slices with olive oil. Grill over direct heat until lightly toasted, turning once. Remove bread from grill and rub with the garlic clove lightly. Season bread with salt and pepper to taste. 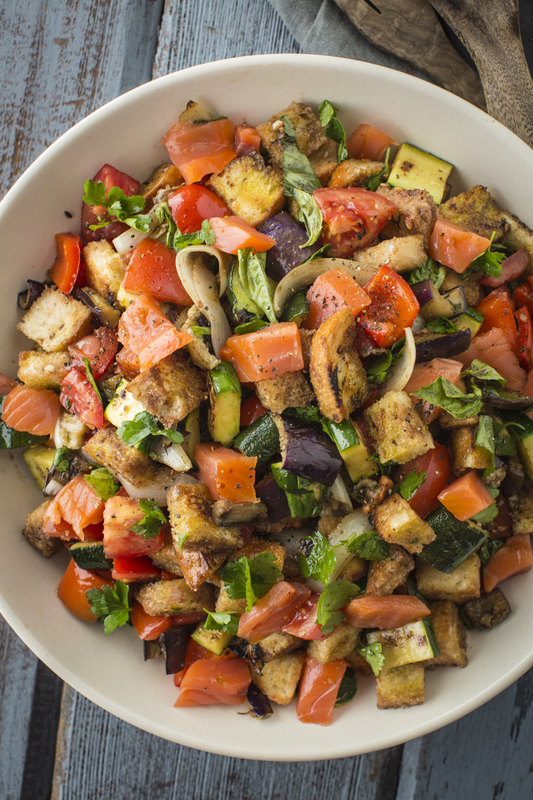 Cut grilled vegetables and bread into 1/4 inch cubes and place in a large bowl. Add diced tomatoes and basil, and season with salt and pepper to taste. In a small bowl, combine the dressing ingredients. Add to vegetable mixture and toss gently to coat. Fold in smoked salmon and parsley. Serve immediately.